It has been a good year for chestnuts this year. 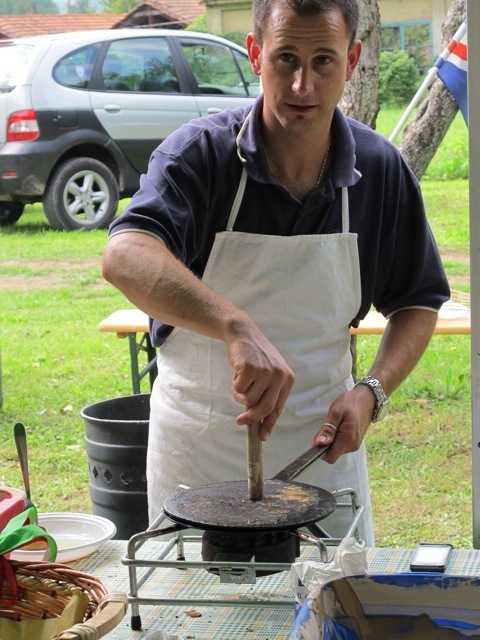 Try some delicious chestnut pancakes in Montefegatesi on Sunday. If you can’t make it on Sunday perhaps you could make your own necci. Place the flour in a bowl with the salt. 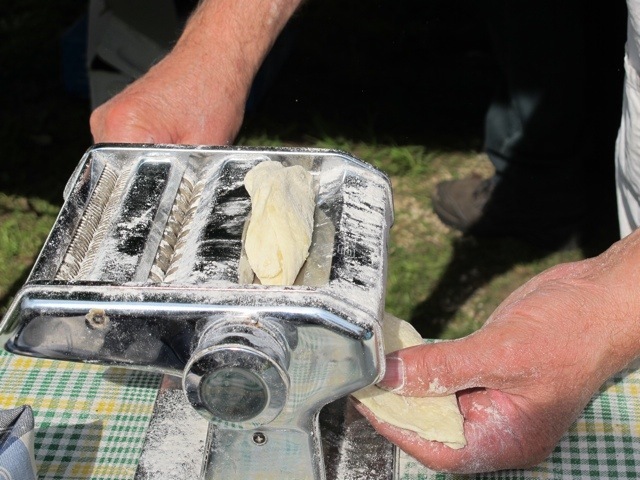 Slowly pour the water into the flour and stir with a whisk until the batter is smooth and there are no lumps. Heat a little olive oil in a frypan and pour in a large spoonful of batter. Swirl the pan to spread the batter evenly. Cook until the bottom is golden then flip and cook the other side. 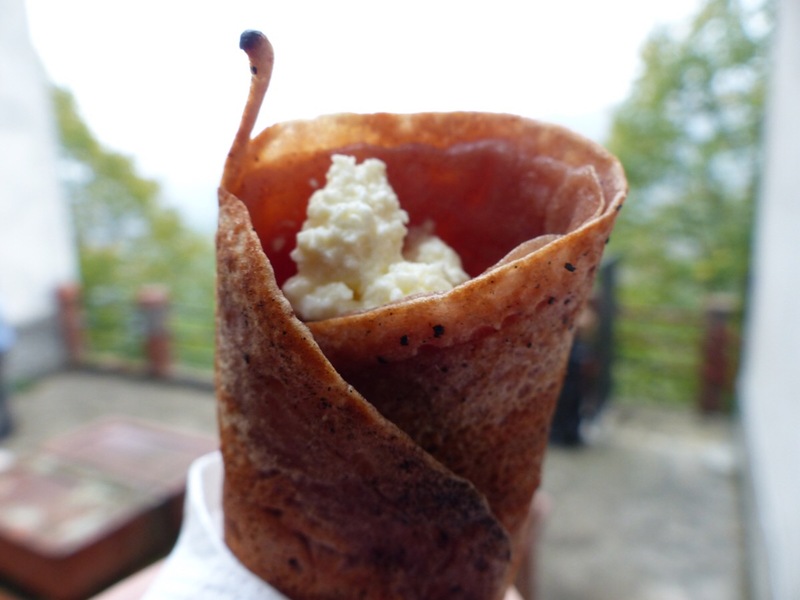 Stack the necci on a plate until all the batter is used. 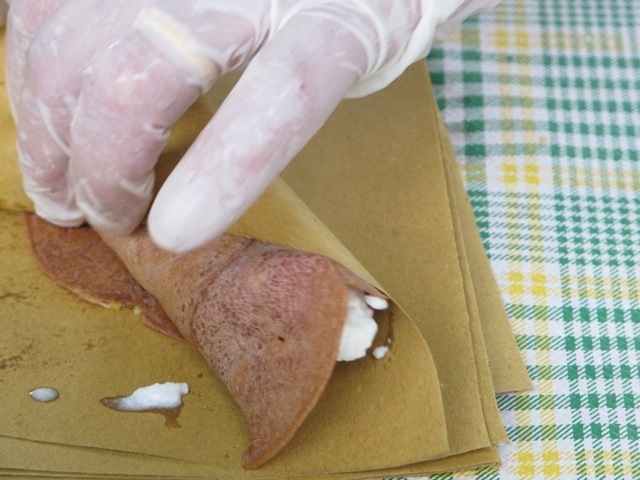 Whip the ricotta and spread on the necci and roll up. 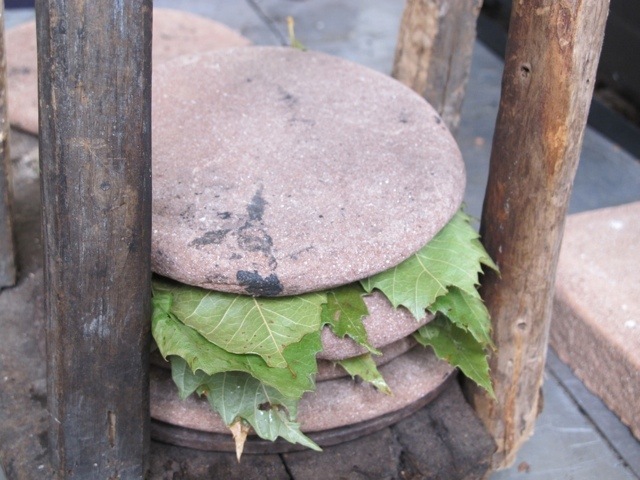 Here is one I enjoyed at the chestnut festival in Lucchio last year. It took me a while to acquire a taste for necci, but I now find them delicious. 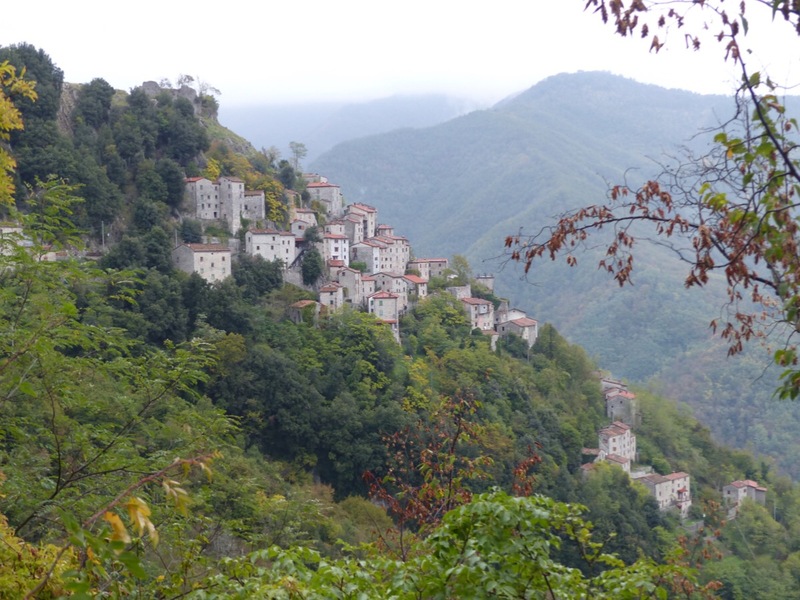 Lucchio is the village that clings to an almost vertical mountain side. 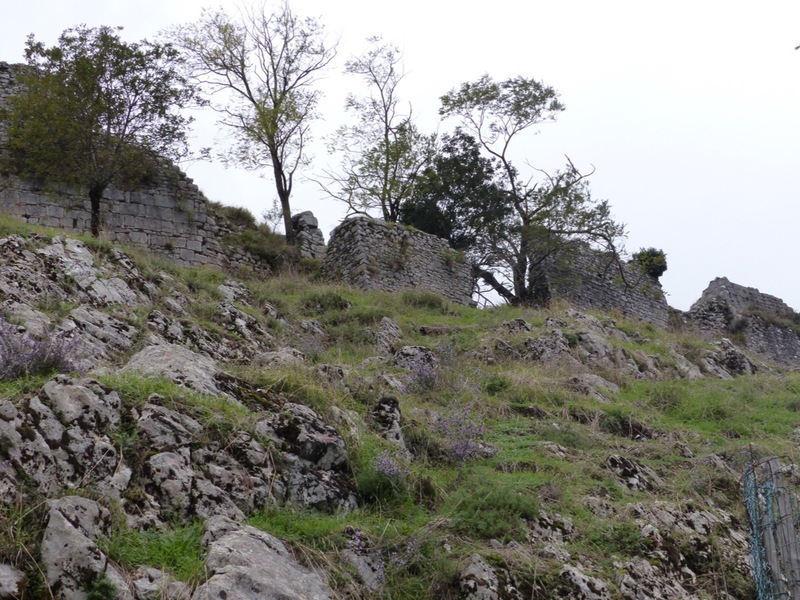 At the top is La Rocca, the ruins of an old fort. 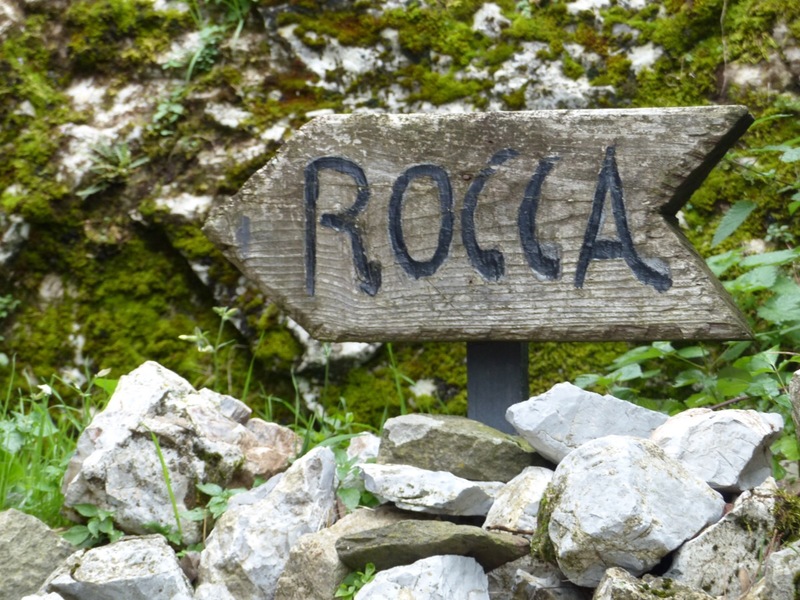 La Rocca was our first destination before seeking out the roasting chestnuts. 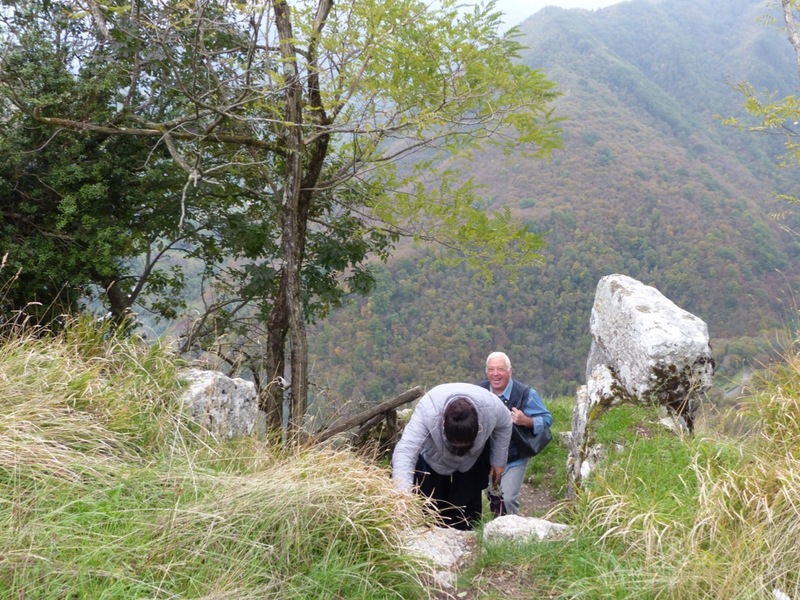 It is a steep climb to the top along a rocky path. 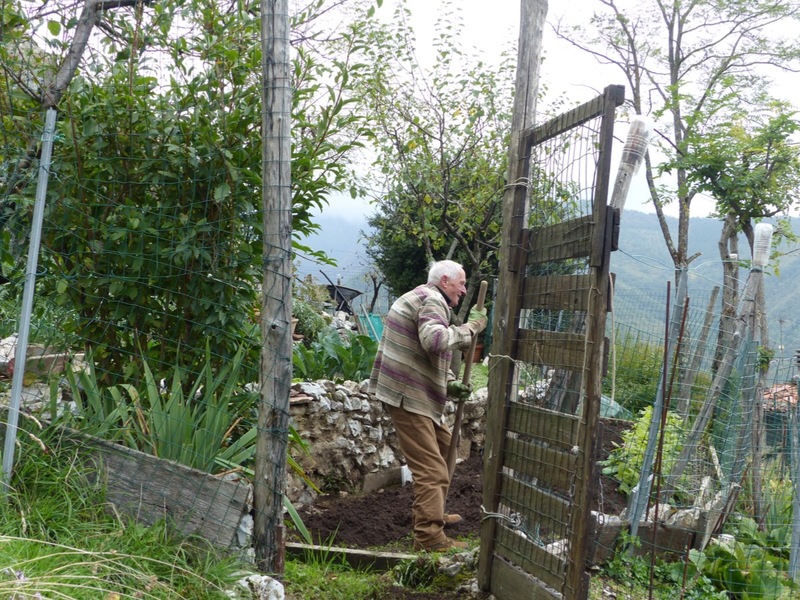 We passed an enthusiastic gardener digging his rich looking soil. 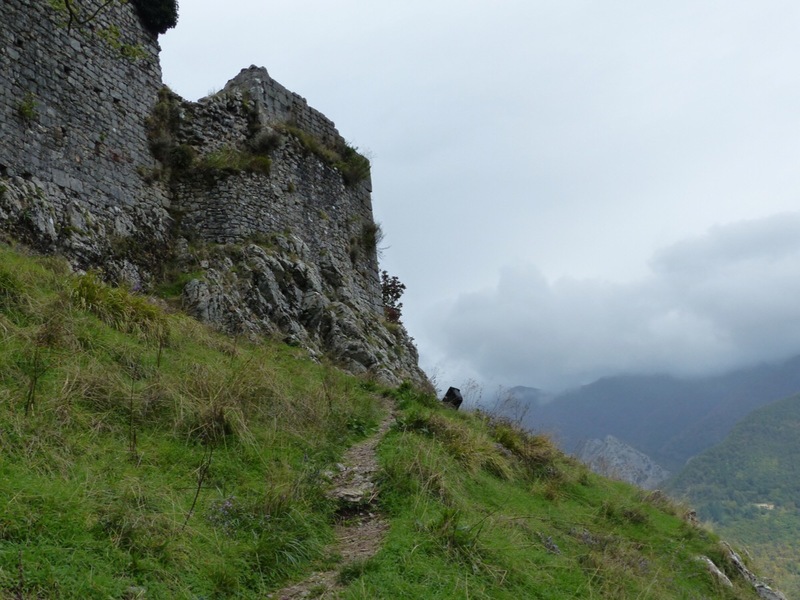 There are some steep steps to the very top. 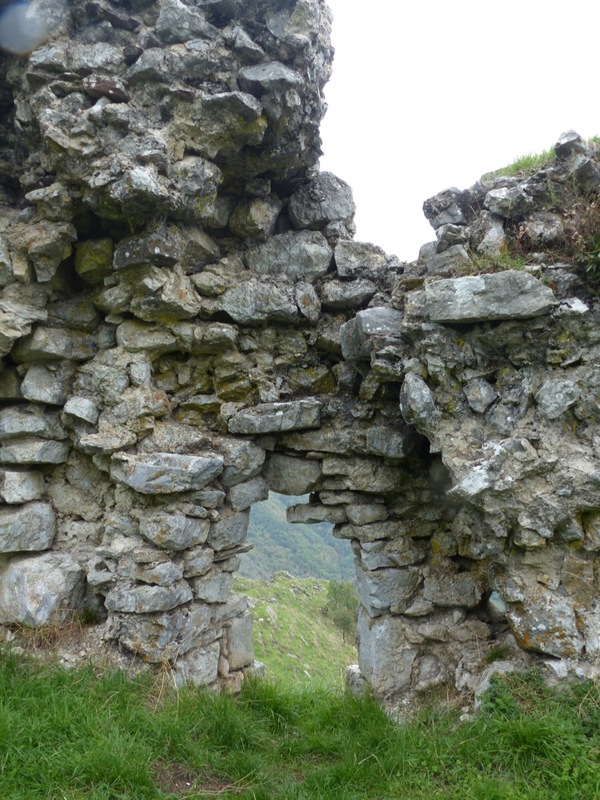 There isn’t much of the fort left, just a few crumbling walls. 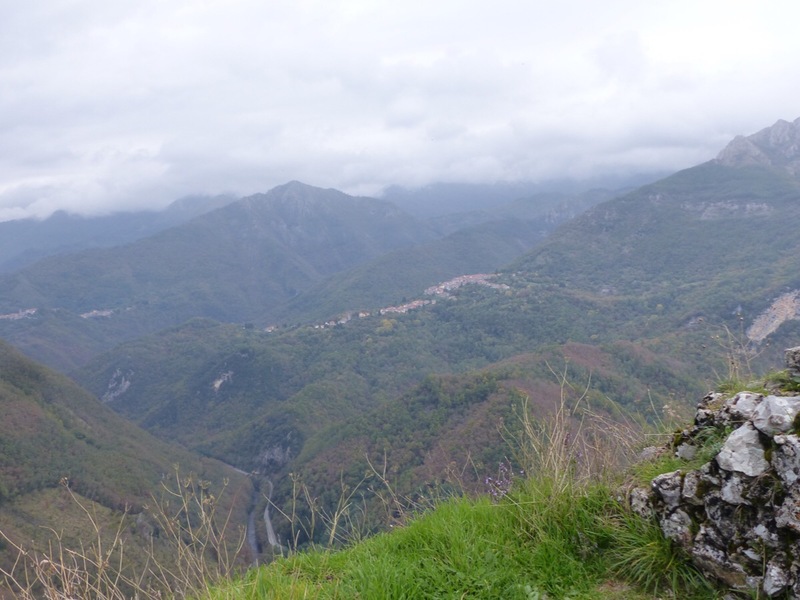 The views are stunning even on a misty, wet day. 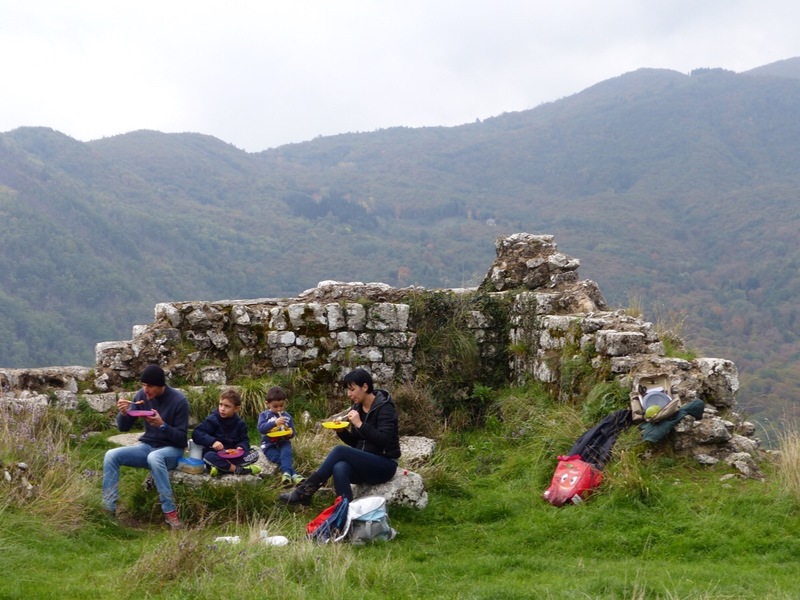 A family found a great spot for a picnic. We had lunch in the local restaurant, which had drawn a large crowd. Our 3 course lunch was delicious. 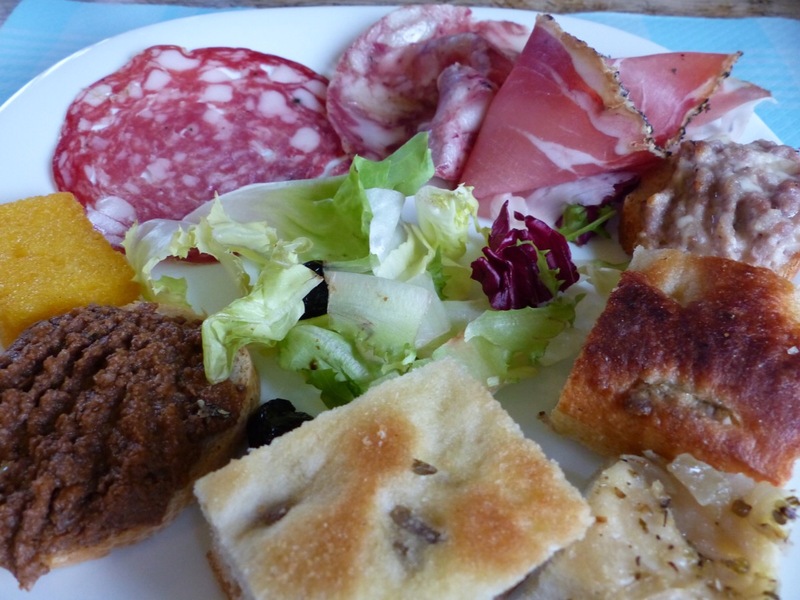 I forgot to photograph the pasta course and the roast meat, but here is the antipasti. 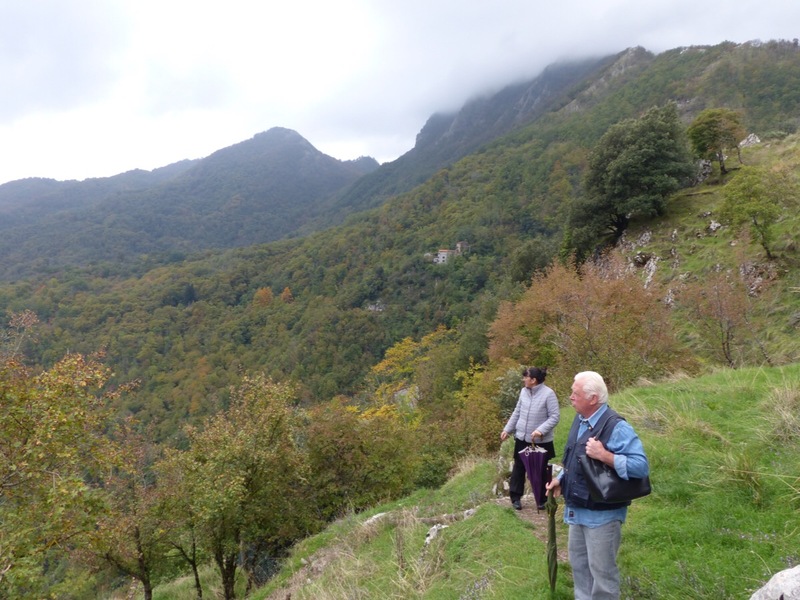 The chestnuts were being roasted down by the church, so this time we headed down towards the bottom of the village. 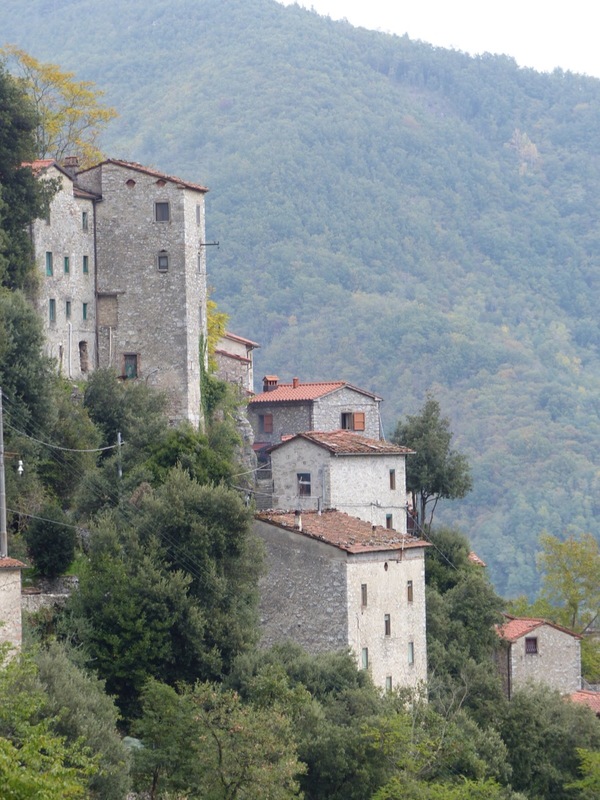 Not many people live in Lucchio these days, but the village is well loved by those who do live there. The streets are well maintained and clean. 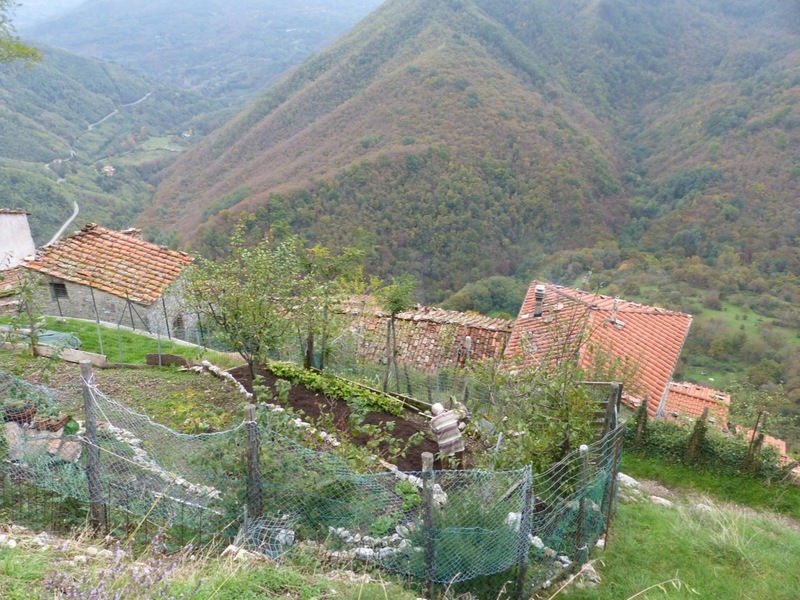 There are a few houses for sale, just in case you are looking for a quiet life with great views. The church was open and later there was to be a concert. 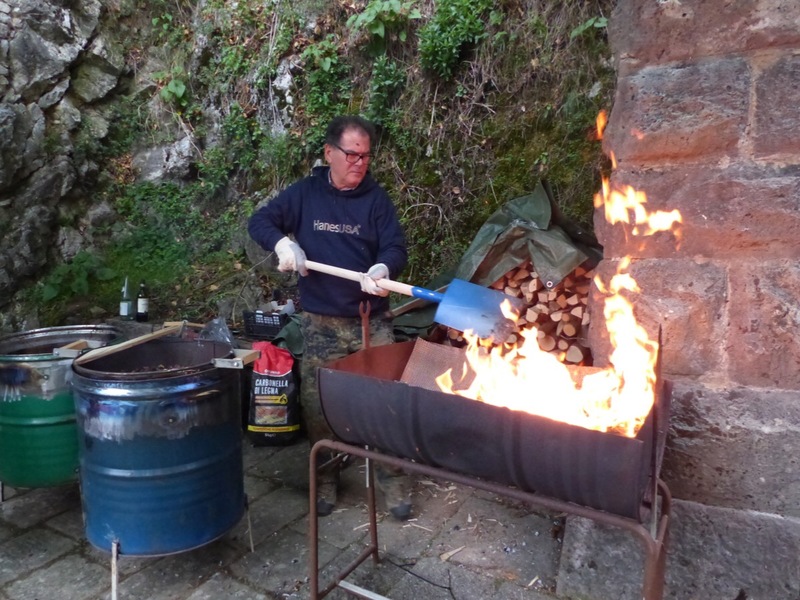 The chestnut roasting was well underway by the time we got there. 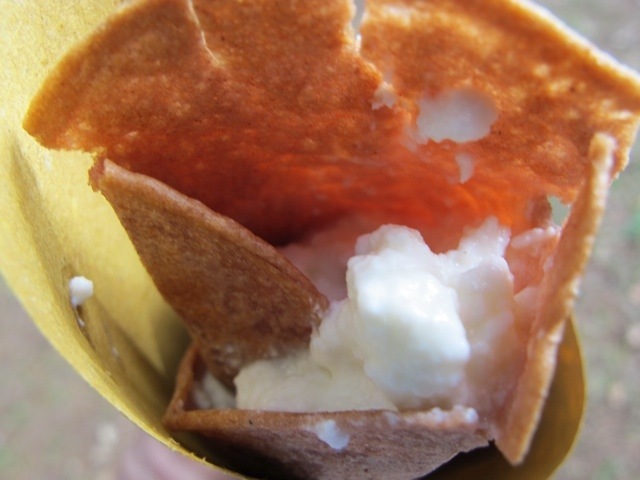 I have acquired a taste for necci with ricotta, and this was the best I have had. 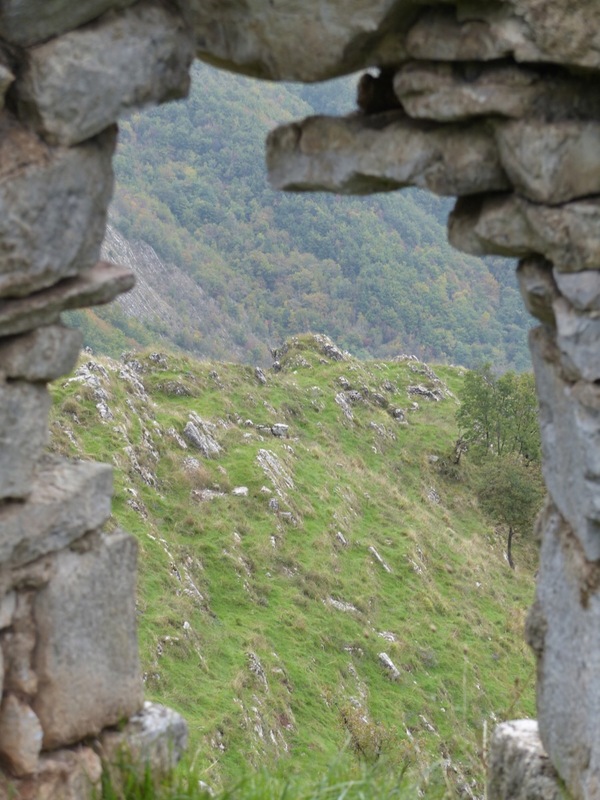 The road down offers glimpses of Lucchio through the trees. 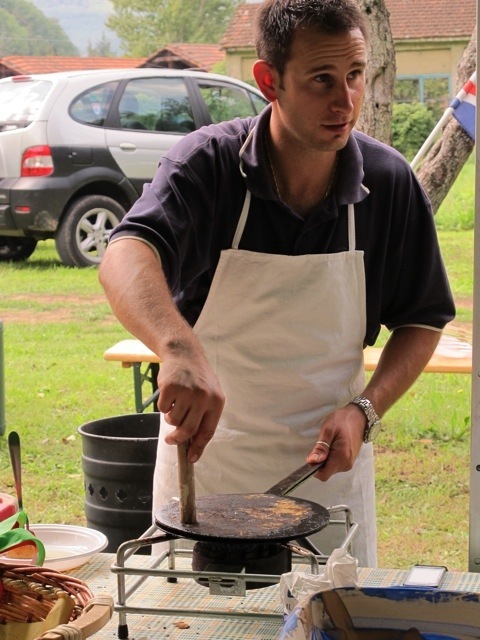 I hope everyone will head up to Benabbio to enjoy some necci…chestnut pancakes. 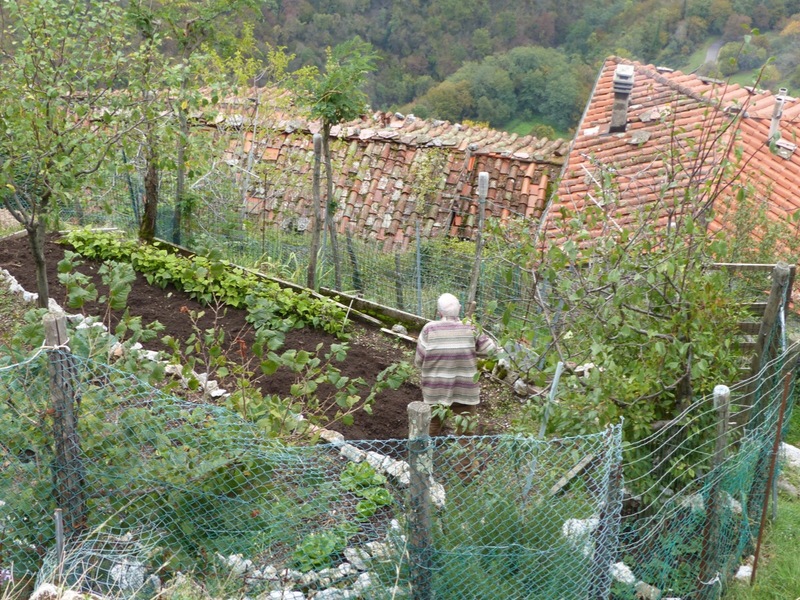 Let’s hope for a fine, sunny 8th November. 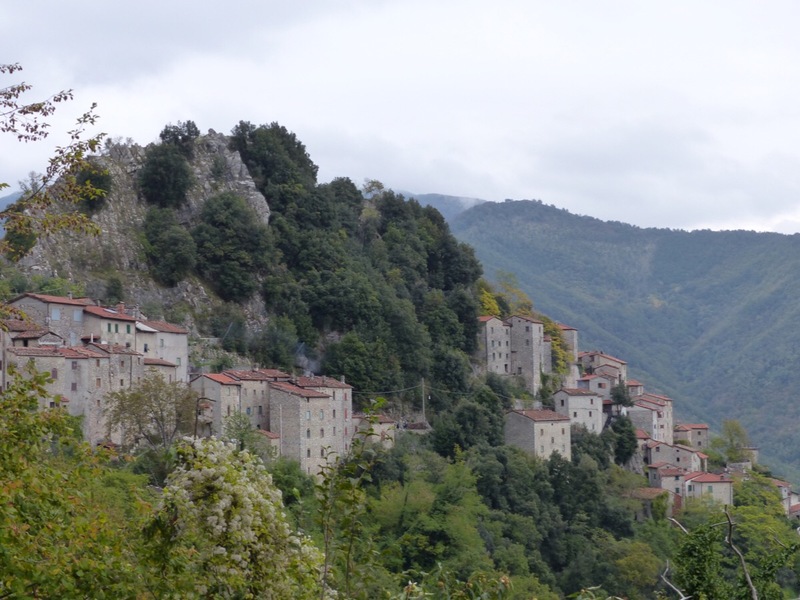 Lots of fun things have been happening in Bagni di Lucca for Christmas. 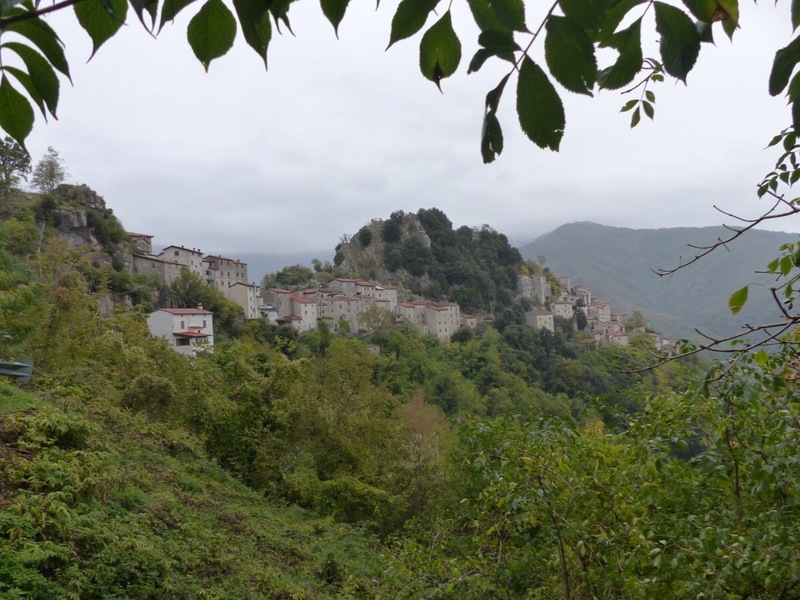 I am in sunny Australia now, but luckily for us Morena from Borgo degli Artisti has been taking photos of events around town. 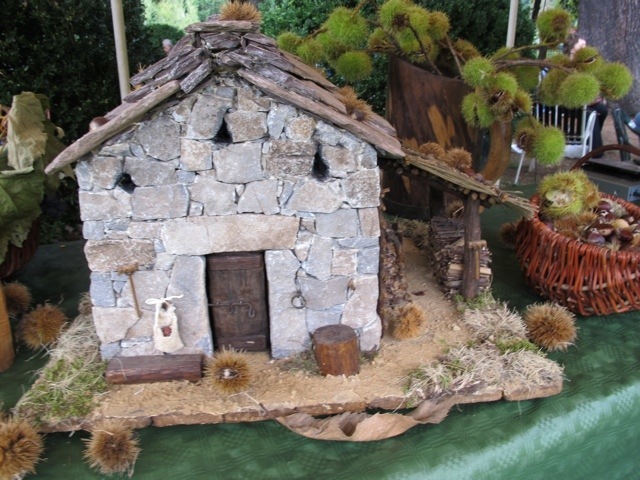 There has been a presepe exhibition at the Circolo dei Forestieri in La Villa. 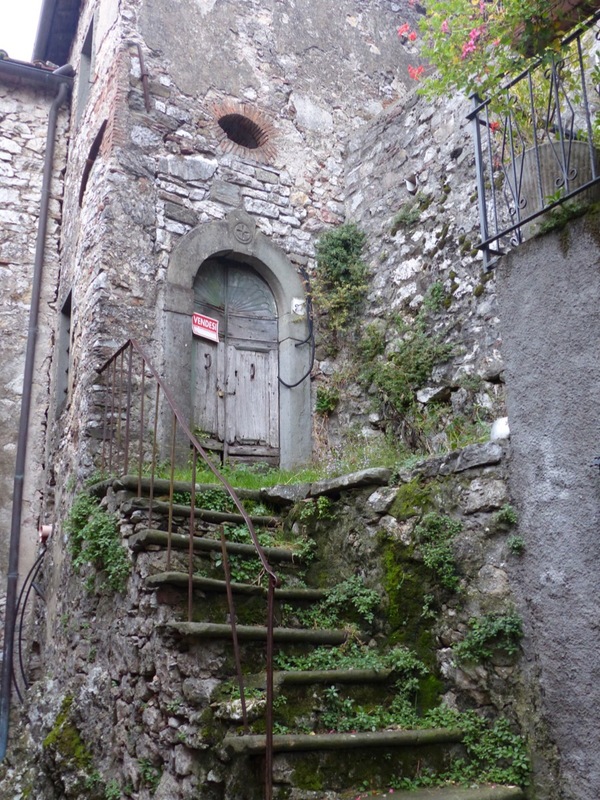 Bagni di Lucca has a history of making presepe…nativity scenes. 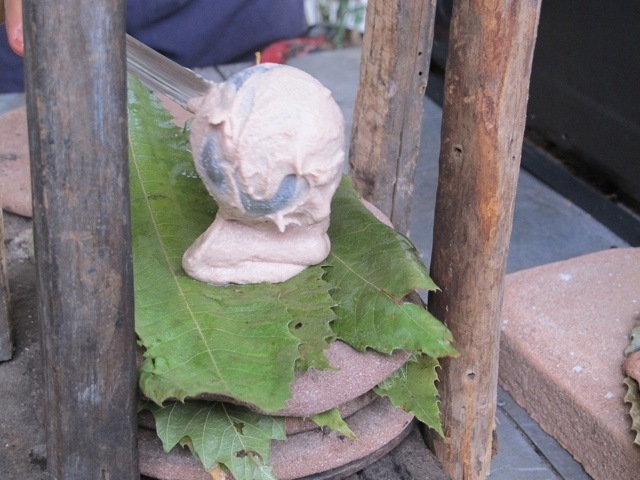 An old mould is on display to show how the statues are made. 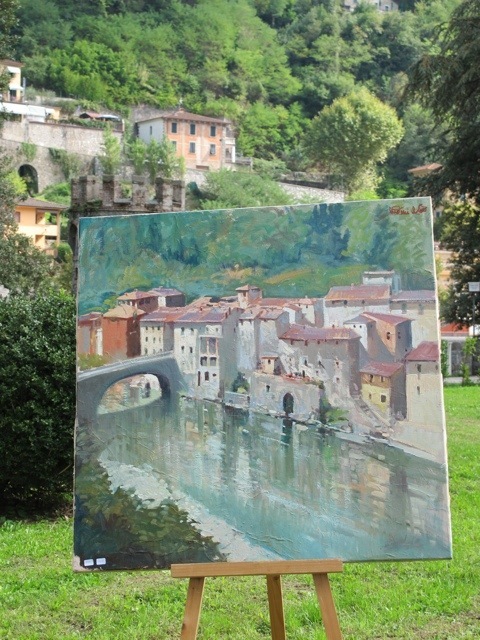 A couple of wonderful old paintings are included in the exhibition. 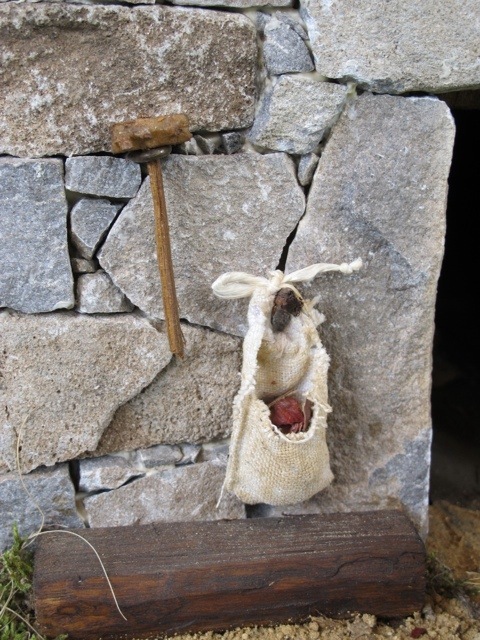 A special presepe has been created by Fontanini, a local company still making presepe, and is in place on the balcony of Circolo dei Forestieri. 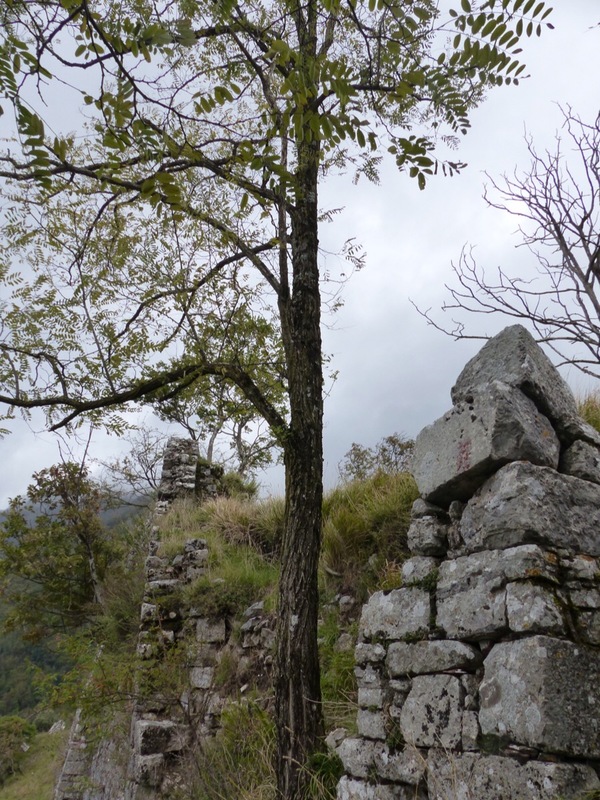 The exhibition will be on display for another couple of weeks…go upstairs at the Circolo dei Forestieri if you are in the area. 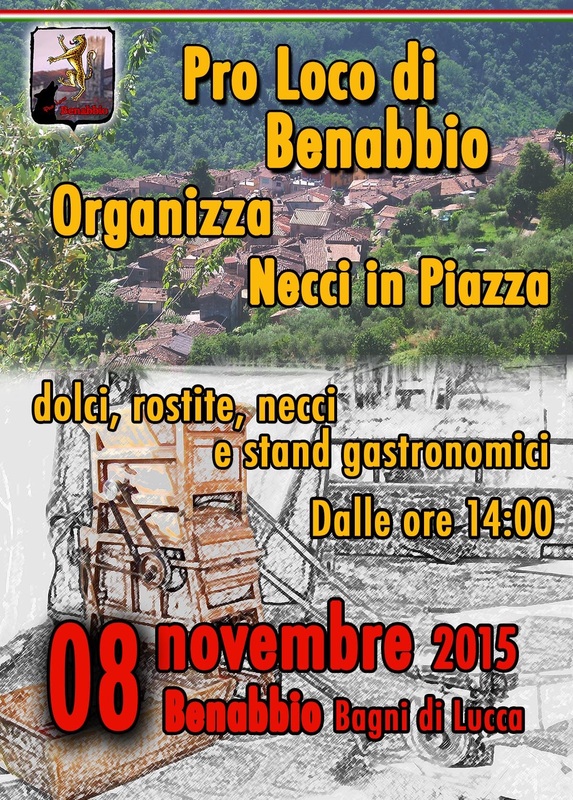 A wonderful event took place in the area in front of Circolo dei Forestieri with the making of an enormous necci. The fires were lit. The giant pans were put in place. 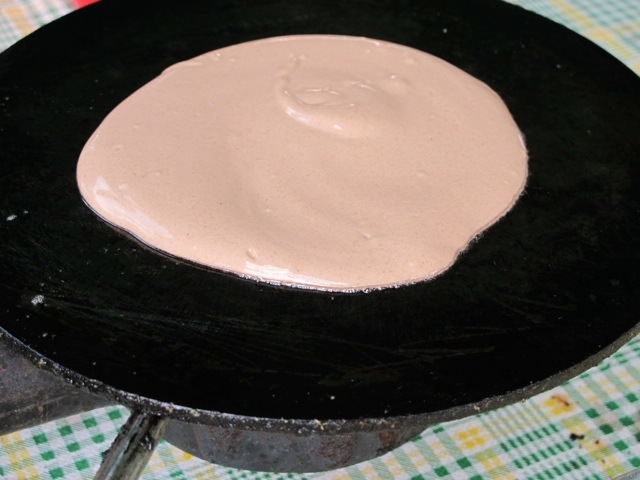 The necci batter was spread on the pan. 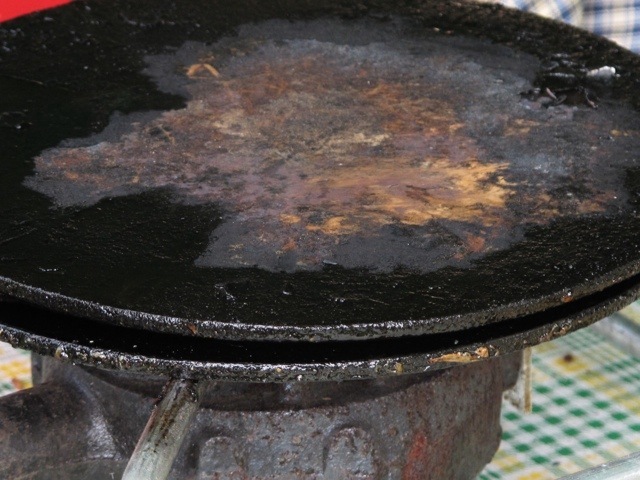 The top of the pan was put on and heat applied. Soon the necci was ready to eat. I can’t tell you how much I wish I had been there for this. I love it when the whole community gets involved. 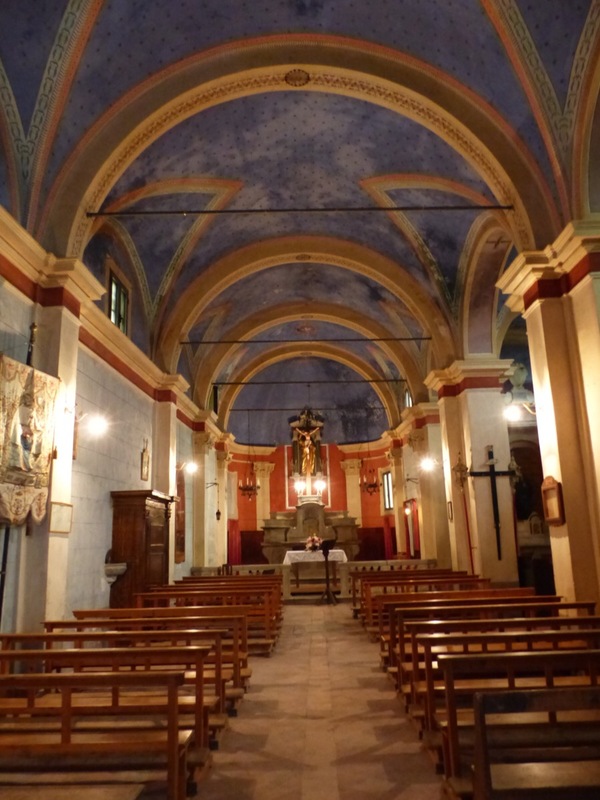 Paula Chesterman has been busy organising a choir and with the help of enthusiastic locals, an hour of hymns and readings from the bible took place the other night. Mulled wine and mince pies were served afterwards…well deserved. The choir will meet again in March. Click here for more information. Morena has been busy with the children of the village with a workshop on elf making. The children then designed a ‘mailart’ envelope with stamp and letters were written to Santa. The best 5 envelopes will awarded on 5th January at the theatre in La Villa. 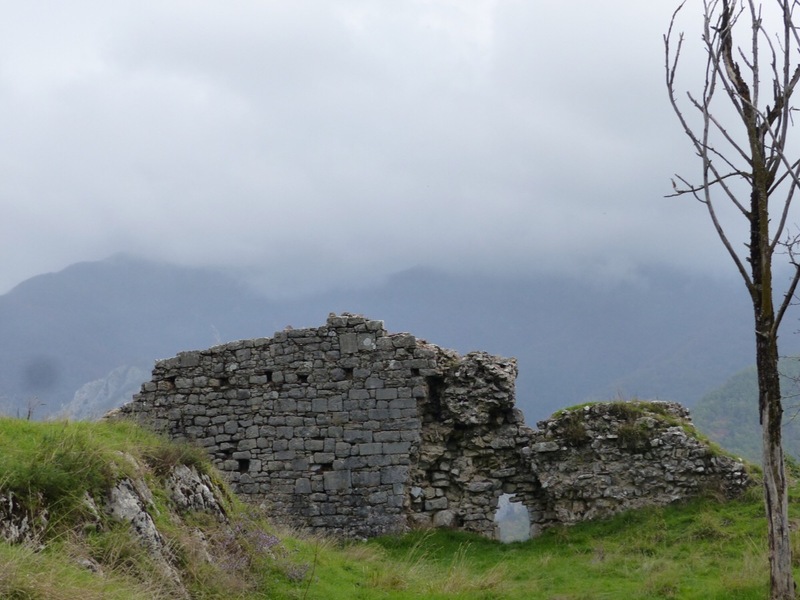 Thank you Morena for being roving reporter for the blog and sharing wonderful local activities with us. 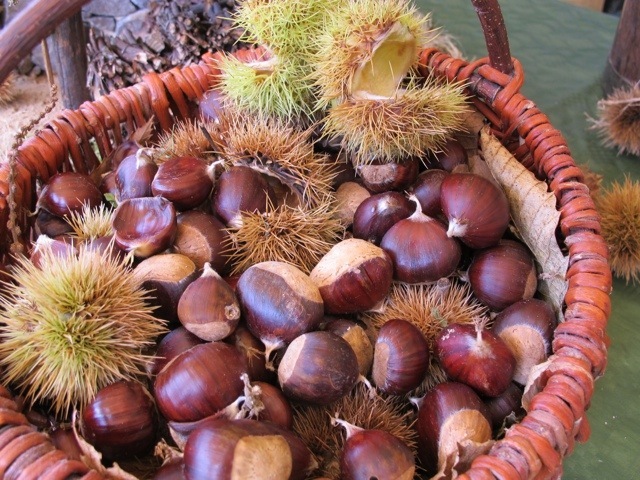 Chestnuts have been an important part of the diet in the Appenine and Apuan regions in northern Tuscany for centuries. 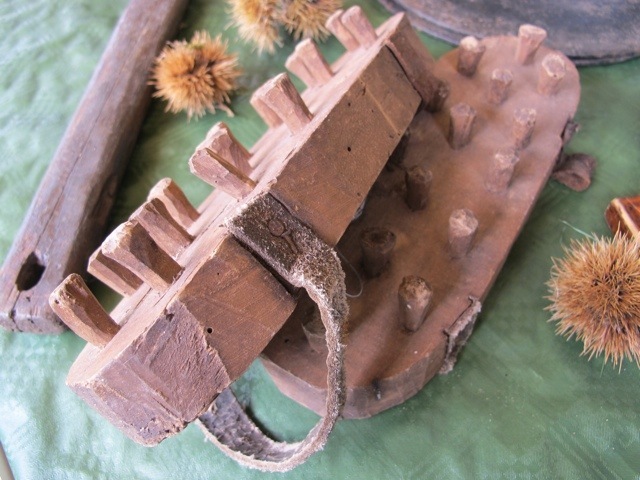 Particularly in times of war and famine, chestnuts saved people from starvation. 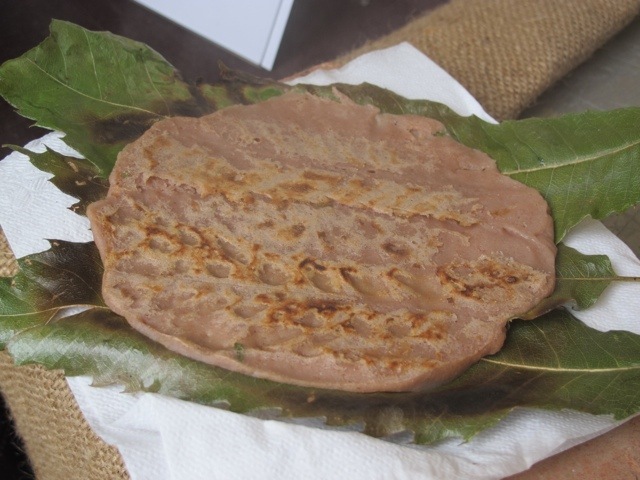 Necci are a type of pancake made from chestnut flour. 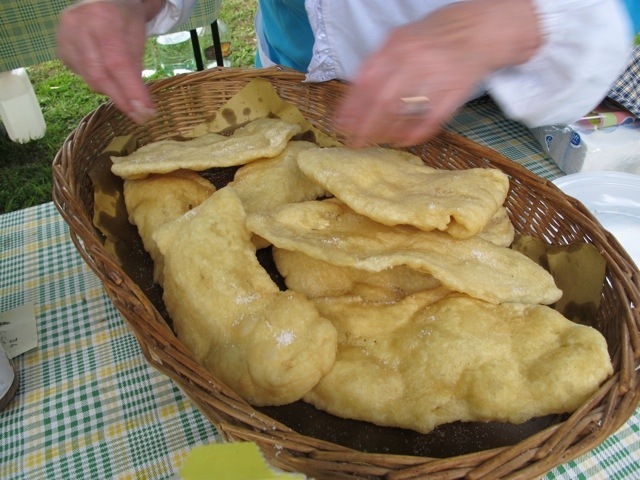 They are simply made by mixing chestnut flour with water (250 grams of flour to 1 cup water). 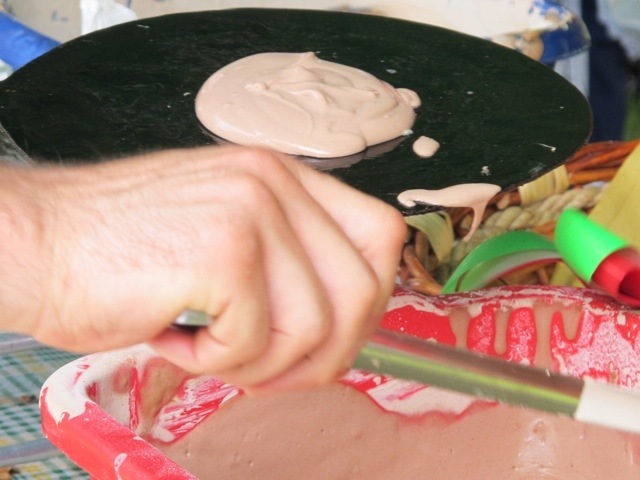 The batter is mixed until smooth and slightly thicker than a normal crepe batter. Each area has a slightly different recipe. Sometimes a little oil and salt is added, or rosemary. 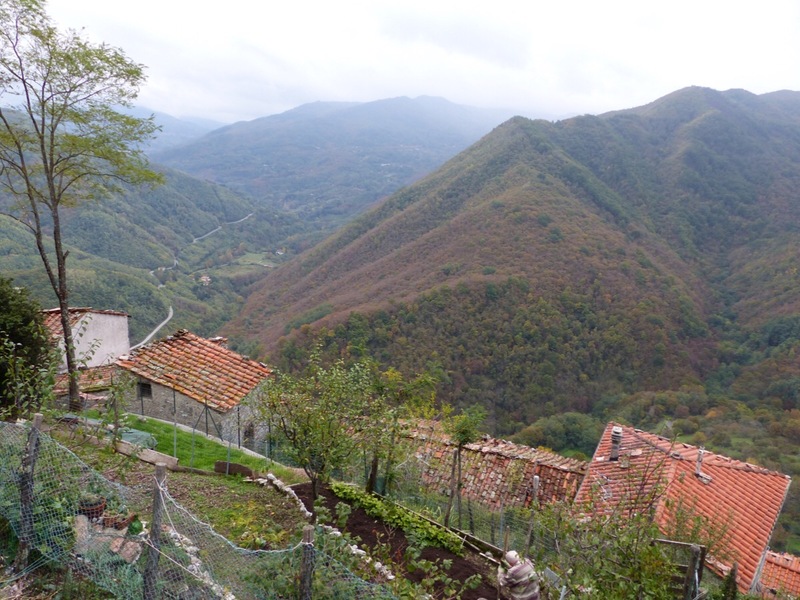 There are several ways to cook the necci. 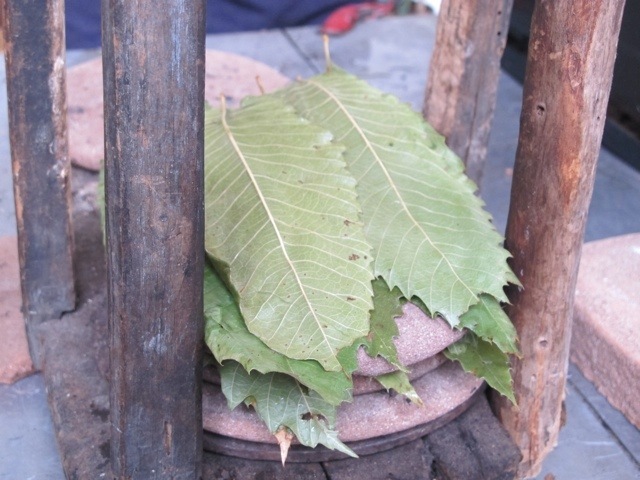 At a couple of chestnut festivals I have seen them cooked between 2 cast iron discs with long handles over a flame. 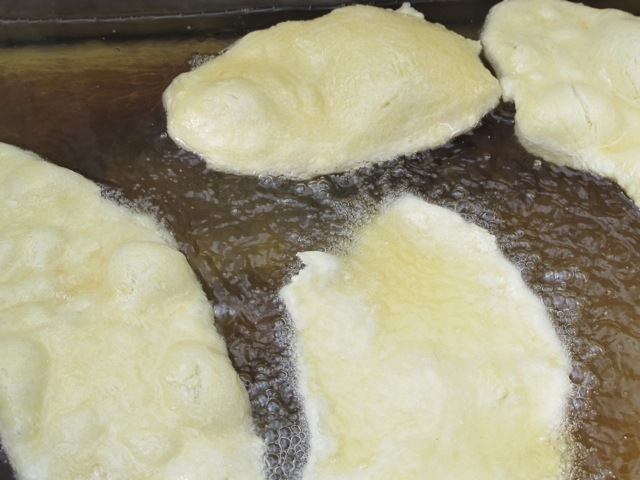 A little olive oil is placed on the flat disc and spread with a potato cut in half, then a small quantity of batter is placed on the disc and spread thinly, and the other disc is put on top. 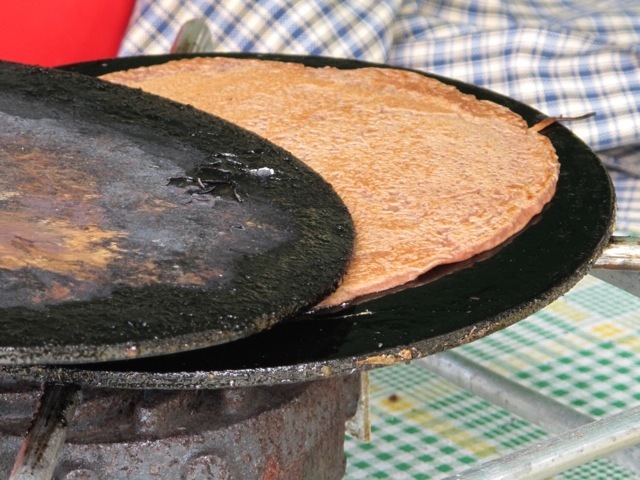 It isn’t as easy as it sounds, you need just the right amount of oil and heat or the pancake sticks to the disc and makes a horrible mess. 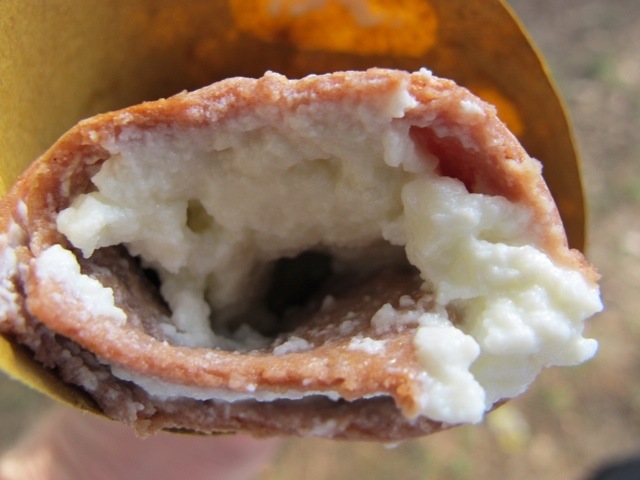 Once browned on both side they are spread with ricotta or nutella and rolled up…and eaten. 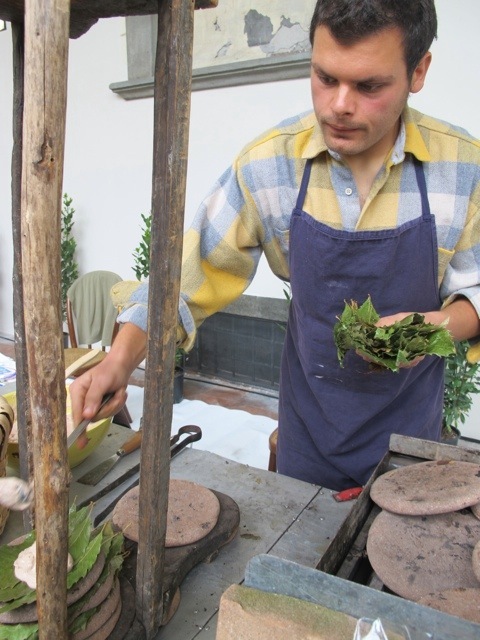 At a food festival in Lucca we saw a very interesting way of cooking necci. 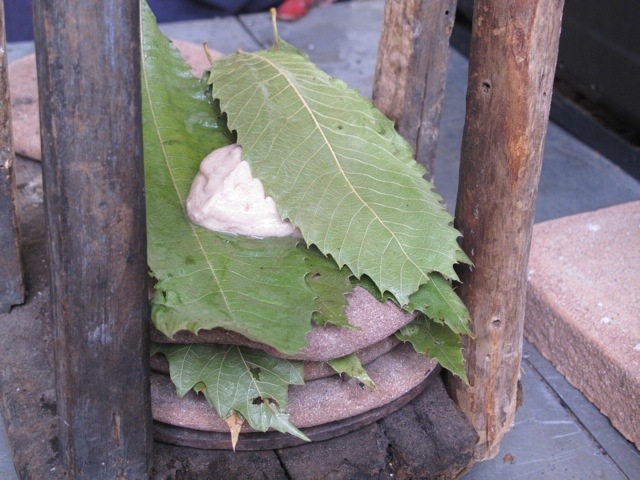 The batter was placed on hot, flat stones covered with chestnut leaves and stacked on top of each other. This method also proved to be effective, and delicious. 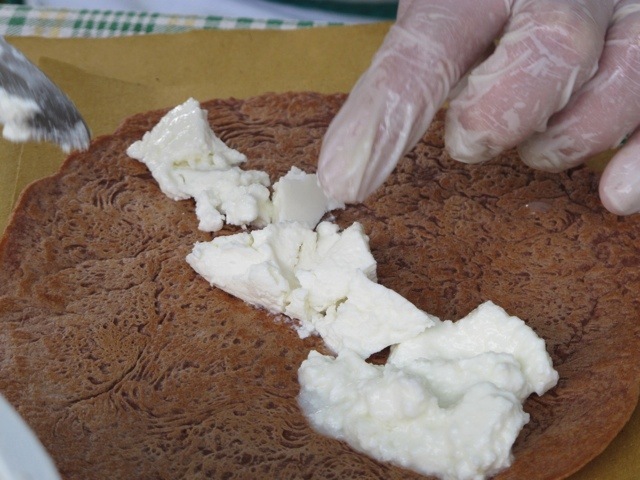 Look for necci at food festivals in the area, or if you are in Lucca, go to Via Buia and look for Pizza da Felice where you can buy necci, along with delicious pizza and cecina, the chickpea pancakes popular in the area. 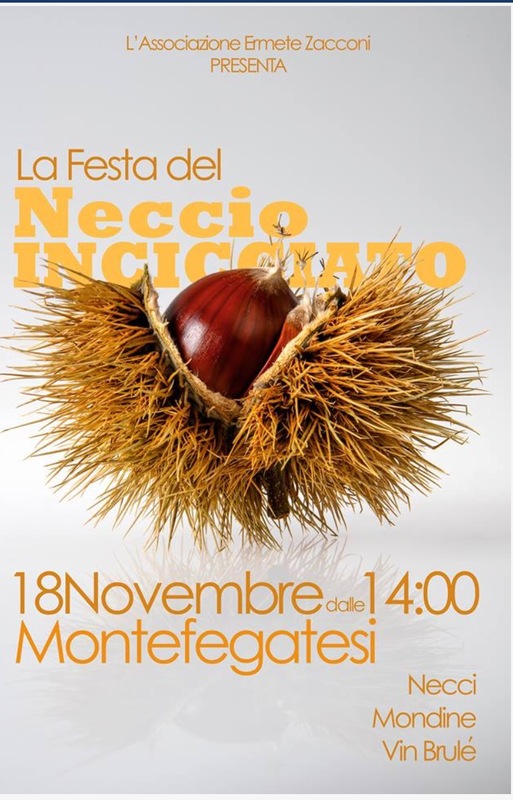 Click here to see a gorgeous chestnut festival in Colognora and here for an equally fabulous one in Lupinaia. 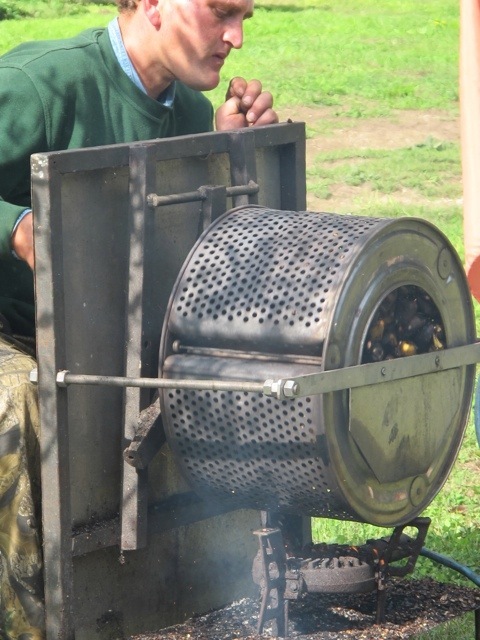 The annual chestnut festival hosted by the Gruppo Alpini and the Borgo Artisti was held on Sunday in the lovely park beside Villa Fiori. 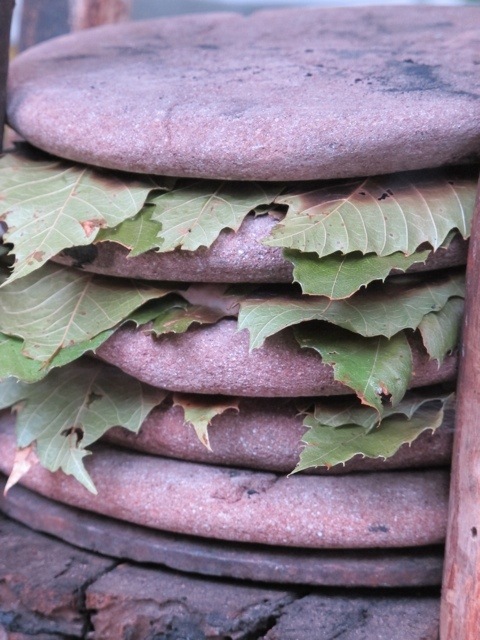 It was a gorgeous autumn day and the chestnuts were roasting. 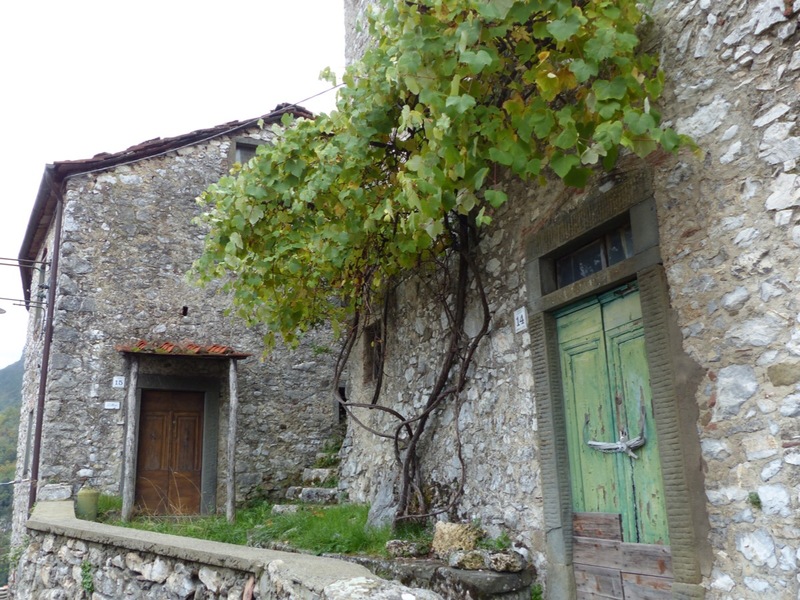 In times of famine and in the lean years after WWII chestnuts formed an important part of the local diet……they deserve to be celebrated. 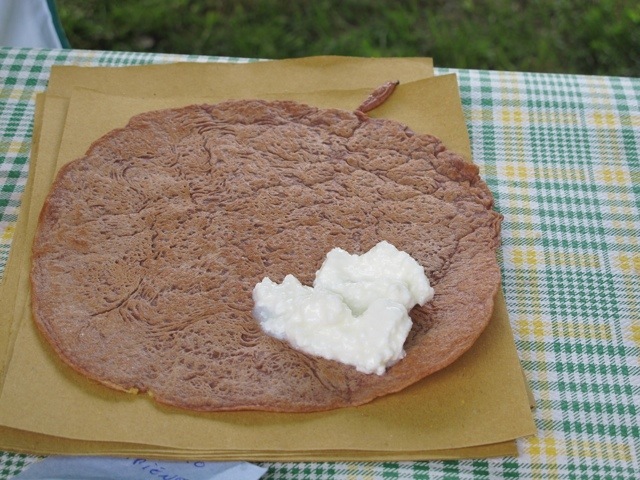 As well as roasted chestnuts, necci (chestnut pancakes) were served with ricotta, sausage or nutella. 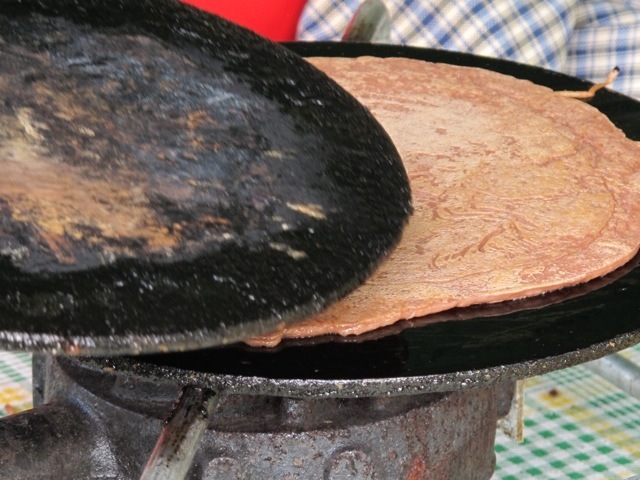 The pancakes are cooked between 2 flat pans over a flame. 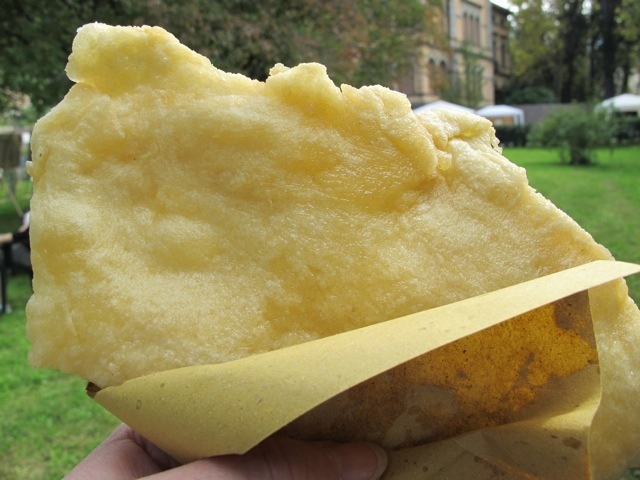 There was also pasta fritta….pasta dough deep fried and salted…..too delicious for words. 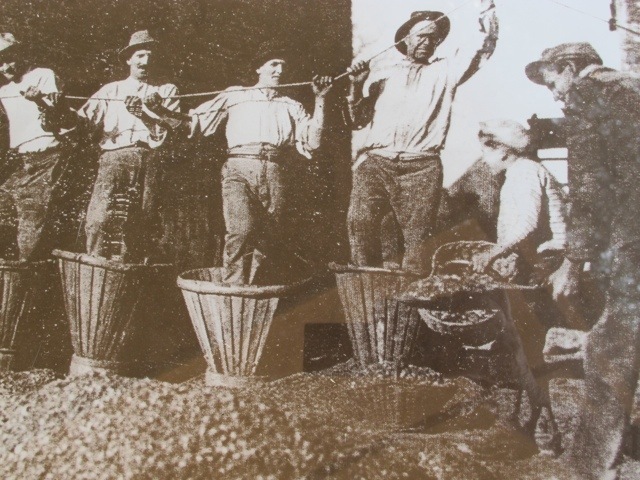 There was a small collection of chestnut memorabilia, including a wonderful old photo of men dehusking chestnuts. 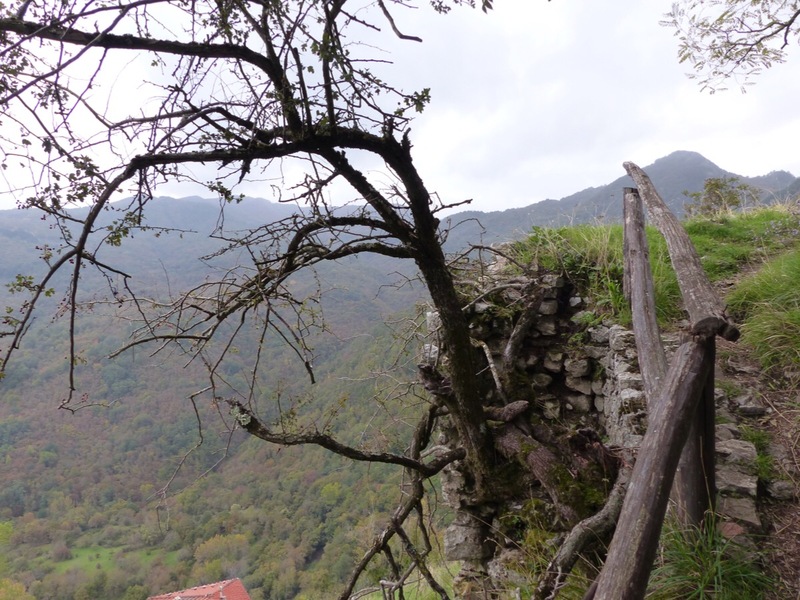 There was a tiny chestnut cottage made by one of the local artists. There was art in the park. 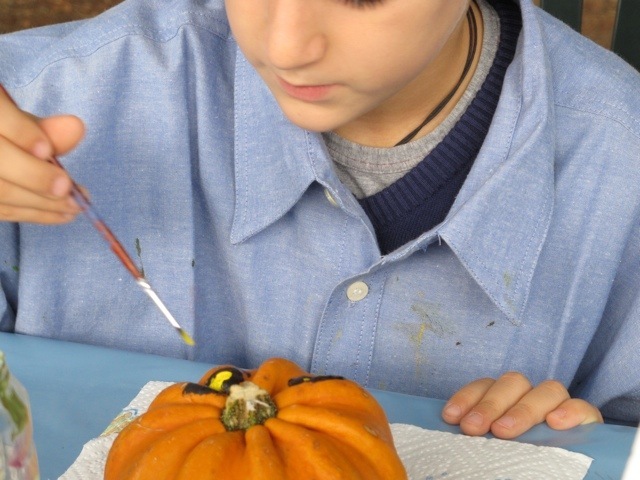 And some very concentrated pumpkin painting. It was a fun day……don’t miss these local events.